Tony Lawrence's Coins & Stuff: Is the 1877 Indian Head Cent really a rare coin? There's no doubt that prices for the 1877 Indian Head Cent are high. Even in the lowest grades, these sell for several hundred dollars and go up rapidly as the grade improves. The coin showed here sold at auction in 2006 for $115,000. There is also no doubt that the mintage is low: 852,500 reported and researchers note that only one reverse die is known, so the real mintage may be 200,000 or less. And yet, these coins are not hard to find. I've seen hundreds in my lifetime and even found one once in a purse of junk that a woman brought to sell. I just checked eBay for these and found 175 being offered for sale and over 200 sold so far this year. Heritage Auctions lists over 2,000 sales at their site and between PCGS and NGC alone, over 6,500 1877's have been graded and slabbed. Some of those may be the same coin resubmitted, but if you want an 1877 for your collection, all you need is the money - these are not hard to acquire! So why the high price? Part of it may be psychological. When the Lincoln Cent was introduced in 1909, there was a sudden surge in coin collecting. 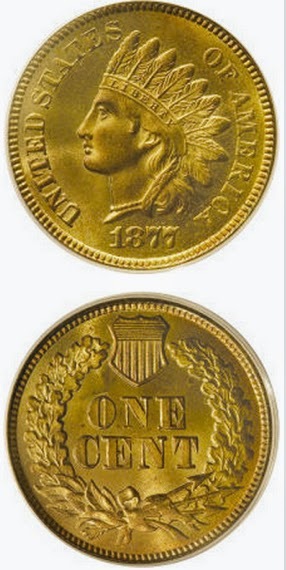 Many, many people started collecting Indian Heads then and the low mintage of the 1877 sticks out like a sore thumb. 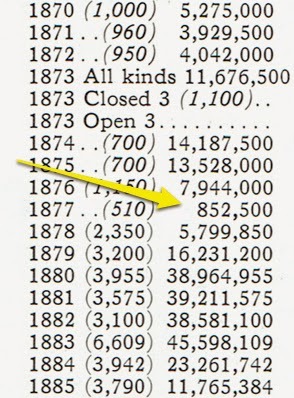 All other dates are in the millions and even tens of millions; the 1877 was obviously more rare. Large and small hoards of Indian Heads were squirreled away after 1909 and that obviously included many, many 1877's pulled from circulation. I think that early surge and the great disparity in mintage figures pushed up the perceived value higher than is justified by the actual rarity. It's interesting to note that PCGS estimates the "all grades" survival of 1877 Indian Cents to be around 5,000 pieces . They estimate the 1878, which sells for a fraction of the 1877 prices, at 4,000 surviving! The same is true for a number of other dates. By the way, the PCGS estimate of 5,000 seems odd when you realize that over 6,000 have been graded just by PCGS and NGC alone. Yes, some may be duplicates and crossovers, but I think it more likely that they are simply wrong. There are also a great many unslabbed 1877's out there, and yes, some may be fakes, but the whole picture seems to paint a much less rare coin. So, while there may only have been a few hundred thousand minted, quite a few were yanked from circulation and are available to buy today. The 1877 is an expensive coin, but it's not truly rare.